Does the Borders boast Britain’s best rugby pub? Last year's winner was the Merchant's Inn at Rugby. Does your local tavern have what it takes to be named Britain’s Best Rugby Pub of 2019? If you think so, then the following competition could be worth a try. After the success of last year’s inaugural quest, organisers of the Aberdeen Standard Investments Melrose Sevens are again calling on pub-going fans to nominate their favourite rugby watering holes. The social media campaign launches today (Friday), when pub customers across the nation are being asked to say why their local deserves the title. Manager James Reeve, of inaugural title holders the Merchant’s Inn at Rugby, said the win gave the venue an unexpected boost. It was up against stiff competition from the Athletic Arms in Edinburgh, the Cabbage Patch at Twickenham, The Palmeira at Hove – and, proudly, the Buccleuch Arms Hotel in St Boswells – to be crowned winners in April last year. James said: “First up, it was a massive shock, but also an honour, to win this competition, as we were up against some of the best in the business. We’ve used the award win in our advertising and promotion and we’ve had a lot more visitors as a result. “The plaque takes pride of place outside our premises and it’s the first thing visitors see when they walk in – they know they are entering Britain’s Best Rugby Pub of 2018. Britain has an abundance of pubs where people come together to enjoy shared interests including rugby, and often the atmosphere in clubs and bars during big-match screenings can be almost as electrifying as you’d find in a stadium. 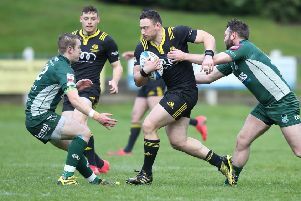 Rugby fans who can’t travel to the Borders to cheer on the home and international teams at the 129th Aberdeen Standard Investments Melrose Sevens, on Saturday, April 13, will be able to savour match day action through television coverage. So it’s a great opportunity for fans to get into some pre-tournament rivalry by putting forward local hostelries as contenders. Whether it’s the good craft beer on tap, big screens showing matches, tasty food or the convivial atmosphere, it’s up to the pub-going public to state why they think their local deserves the honour. Douglas Hardie, president of Melrose Rugby Club, said: “It’s all to play for – we can’t wait to hear the pub-going public’s suggestions for the 2019 Rugby Pub of the Year. “Going by last year’s experience, we expect this competition to generate plenty of competitive rivalry, just as there will be on the pitch at Melrose on April 13. Fans are encouraged share their comments – and pictures – on Melrose Sevens social media www.facebook.com/melrosevens, or Twitter @melrose7s using the hashtag #bestrugbypub. Voting closes on March 1 and, after reviewing the entries, a shortlist will be drawn up. It will then go to a public vote, with the winner announced before this year’s Melrose Sevens. The pub that gains the most votes will receive the coveted title and an inscribed plaque to recognise the achievement. The Aberdeen Standard Investments Melrose Sevens is a great day out for families, couples and rugby fans who enjoy fast and exhilarating sporting action. If you can’t make it to Melrose, watch BBC coverage through BBC Scotland, which is available outside Scotland on Freesat, Sky and Virgin Media. For more information, and to book tickets, visit www.melrose7s.com. Keep up to date with the action thruggh your local newspapers, as well as on Facebook at www.facebook.com/melrose7s, Twitter www.twitter.com/melrose7s or @melrose7s and Instagram www.instagram.com/melrose7s or @melrose7s.